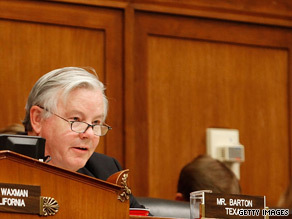 Barton is facing fire from a string of his GOP colleagues. (CNN) – A string of Republicans are taking aim at Rep. Joe Barton's sentiments earlier Thursday that criticized the Obama administration for pushing BP to set aside $20 billion for damage compensation. Barton, the ranking Republican on the House Energy and Commerce Committee, later apologized "if anything I've said this morning has been misconstrued." Several GOP sources tell CNN he was under pressure from his own leadership to make a statement. Within minutes of his verbal apology, Barton released a written statement retracting his apology to BP. Mr. Barton’s remarks are out of touch with this tragedy and I feel his comments call into question his judgment and ability to serve in a leadership on the Energy and Commerce Committee. He should step down as Ranking Member of the Committee, "said Rep. Jeff Miller, a Republican who represents portions of the Florida coastline significantly impacted by the BP oil spill. Meanwhile, Rep. Adam Putnam, another Florida Republican, said Barton "owes the people of the gulf coast an apology, not the CEO of the company that caused this mess." On Miller's call for Barton step down from the committee post, Putnam didn't outright call for the Texas Republican to resign, but said," There are a lot of conversations going on right now." Rep Steve Scalise, a Louisiana Republican, also said he disagreed with the comments and added he was informed Barton was going to retract them. Scalise also said that "it's not my decision to make" if Barton remains in his leadership position. House Minority Leader John Boehner also added his voice to the GOP chorus disagreeing with Barton's comments. "I have said since the beginning that BP ought to be held responsible for every dime of this tragedy," the Ohio Republican said. "They ought to be held accountable to stop the leak and get it cleaned up as soon as possible." The uproar came hours after Barton expressed regret to BP Chairman Tony Hayward that the company was forced to set aside the massive sum of money in an escrow account to pay for future claims arising from the oil spill. "I am ashamed of what happened at the White House yesterday," he said during a congressional hearing in which Hayward was testifying. "I think it is a tragedy of the first proportion that a private corporation would be subjected to what I would characterize as a shakedown – in this case a $20 billion dollar shakedown." White House Press Secretary Robert Gibbs said in a statement Thursday that "members from both parties should repudiate [Barton's] comments." Vice President Joe Biden also took aim at Barton Thursday, calling his comments "incredibly insensitive, incredibly out of touch." Some Republicans however have expressed sentiments similar to Barton’s. Speaking at the Heritage Foundation, Rep. Michele Bachmann called the escrow fund “extortion.” And Rep. Tom Price said in a statement that President Obama has “no legal authority” to force BP to set aside a damage fund. The man should resign from the Congress of the United States, the greatest government in the history of the world, for what he said in his opening statement. He needs a doctor and badly. What's this? Trouble inside the Republican juggerNOT? Could it be that they are about to eat some of their own? Can't figure out the talking points? Can you hear it?. . . .FLUSH! The sound of the Republican Party as they try to figure out what they have done to themselves! HA HA HA, it sure looks good on them! Too late you all ready said what was really in your heart. Vote this bum off the island.